The hunt is on for UFO's - UFO Hunters are heading to the basin to guide a Utah film maker to areas where oral and written history shows there has been some rather strange occurences in the past. Alien Dave comments on the possible hazards and risks of accidentally introducing extraterrestrial microbe's /samples into our environment with the landing of NASA's capsules, Genesis & Stardust at the Utah Test and Training Range, Dugway. IN A NEWS STORY, ARTICLE, REPORT, ETC. This awesome photo along with several other UFO photos taken by Dave Rosenfeld are published on the March 2004 cover of the Brazilian UFO Magazine - also included in this issue are numerous photos from the UUFOH 2002 & 2003 Ranch Recon collection to be published with George Knapp's Skinwalker articles in both the March & April issues. But unlike the popular U.S. UFO Magazine who used one of our Ranch recon photos and credited us in a less than respectable way, (click here) they will be posted in ufo with 'Full' credit to UUFOH & Dave Rosenfeld. - Unfortunately, there is no English version, of the mag or the website as of yet. Editor - A.J. said : "Dave. Thank you so much for the photos you sent... Indeed !!! George's article would be useless without them... they will be fully credited." A.J. is honest, deserving and thankful, he also knows good photos when he sees them! For his respect and cooperation with UUFOH he recieved several photos that haven't been released yet from UUFOH for his magazines March & April 2004 issues. He thinks UUFOH is doing a great job and we will have other photos / articles of ours published in his well done magazine in the future. Report notes: "Check out the action in this shot taken by Dave Rosenfeld of Utah UFO Hunters. In it, you can see star trails in the lake and the orange glow of nearby campfires." Salt Lake City-produced UFO Dust—a 100-percent pure habeñero powder supposedly harvested off-planet, It will mess you up, but it’s still legal in Utah. Alien hunters and nerve agent contamination may be prompting Dugway Proving Ground to seek to expand its size. Dave Rosenfeld, president of Utah UFO Hunters, has an Internet page devoted to tracking strange goings-on at Dugway, including "alien presence." The page is at www.aliendave.com/UUFOH_DugwayProvingGrounds.html. "Numerous UFOs have been seen and reported in the area in and around Dugway," Rosenfeld, who goes by the nickname "Alien Dave," said in e-mail to the Deseret Morning News. Most of the disks, black triangles, orange spheres, flying wings and manta ray-shaped objects must be secret military aircraft, he thinks. But Rosenfeld added that military aircraft can't account for "all the unknowns seen in the area. It might be that our star visitors are keeping an eye on Dugway too!" He considers Dugway "the new area 51. And probably the new military spaceport." Responding to a question, he wrote, "Yes, we have been watching Dugway and the UTTR (the Air Force's Utah Test and Training Range), we have seen some very interesting things out there." Dr. Ed Craft the host of Magick Mind Radio. Invites Dave Rosenfeld as a guest for his show on Wednesday November 10th between 9-10pm ET for our Wed broadcast on Pioneer Radio London. Was - CANCELLED- and will be rescheduled -It is a 3 time weekly International internet broadcast on a variety of subjects ranging from magick and the spiritual to the paranormal and ufology. DAVE ROSENFELD, "Alien Dave", is sometimes called Salt Lake City's own real-life Fox Mulder, Alien Dave dives into the Paranormal realm of UFO's, Alien's, Cropcircles, and the like, with a passion and desire to find answers to the mysteries of the unknown. This next story doesn't exist. In fact, the information you read here is totally top secret! "WE'RE JUST ABOUT THE TRUTH AND WITH DUGWAY MORE OR LESS IN OUR BACKYARD IT'S SOMETHING TO WATCH. NOBODY REALLY KNOWS WHAT THEY'RE DOING OUT THERE." U.F.O watchers may have another place to ply their trade....the Utah desert! subject: GENESIS CRASH In Utah's West Desert- solar samples force fed "Dugway's peanut butter" (a bio-chemical soup from decades of exotic testing still present in the mud at UTTR.) as the capsule impacted the ground and broke open. subject: UUFOH West Desert Skywatch - "Who's Playing god?" "In the second hour Alien Dave Rosenfeld returns to give us a strange report about what he and several other investigators saw while on skywatch in the west deserts of Utah. Looking South- S West, from the border, 5 investigators witnessed a large beam of light going straight up, a huge amount of light that flickered intensively surrounding it. After witnessing this strange phenomenon many of the investigators felt sick for a couple of days and suffered mild sunburn." Find out what is happening in Florida and Utah this Saturday on Ground Zero! Topics: The Elohim investigation, The Mexico UFO footage. The Genesis capsule landing. 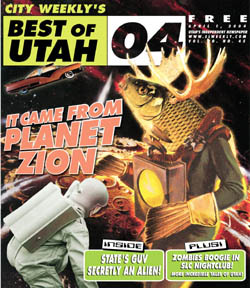 l Eddie Middleton host of the worldparanormalforum.com invited Alien Dave to be a guest on his internet radio show on 5/13/04 Thursday night 9-10pm on the realityradionetwork.com - subject: Utah's UFO & Paranormal activity, the Bigelow ranch, & more. "It was a pleasure talking with you Eddie, the conversation was indeed a mutual learning experience" - Alien Dave. "WakeUp USA--A UFO Study." This show is produced by Stardust Enterprises (www.stardustent.com) and is hosted by Joe Montaldo ( National Director, ICAR--International Community for Alien Research www.icar1.com) Alien Dave was invited to be a guest on Wake Up USA an Internet Radio show with a virtual audience thats broadcast worldwide to 23 countries. thanks to Georgia Scott:"Your website is impressive, my compliments to your webmaster."